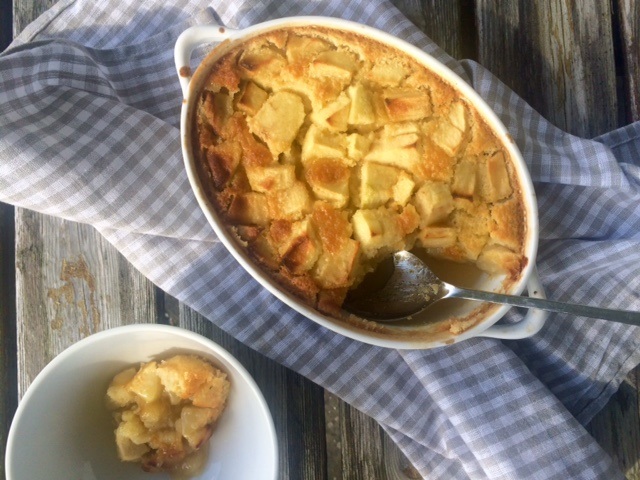 This apple cider pudding recipe is the ultimate no fuss autumn dessert, highlighting just how delicious Irish apples are at the height of the season. While it may seem like a strange method, pouring the cider mix onto the cake batter means it sinks to the bottom to form a cider toffee sauce of sorts meaning there’s no need to make a custard to pour on top. This saucy little number looks after itself and is as easy as it gets. 2. Place apple pieces in an ovenproof dish. 4. Place cider, golden syrup and 100g sugar in a saucepan and bring to the boil to dissolve the sugar. 5. Whisk together the milk, egg and vanilla and add to the dry ingredients, whisking until smooth. 6. Pour the cake batter over the apples evenly. 7. Pour the cider mix evenly on top of the batter, it will sink to the bottom during cooking. 8. Place the pudding into the oven and cook for 30-35, until golden. 9. Remove from the oven and serve warm with vanilla mascarpone or ice cream.